September 04, 2010 - Polar Air Cargo LLC (“Polar LLC”) confirmed that it has reached an agreement with the U.S. Department of Justice (“DOJ”) Antitrust Division to resolve a previously disclosed investigation of alleged manipulation by cargo carriers of fuel surcharges and other rate components for air cargo services. The agreement is with Polar LLC, a wholly owned subsidiary of Atlas Air Worldwide Holdings, Inc. (“AAWW”), not to be confused with Polar Air Cargo Worldwide, Inc., AAWW’s majority owned operating subsidiary, which is not implicated. The amount of the fine is $17.4 million, payable in installments over five years. The agreement is related to shipments from the United States to Australia during the period from January 2000 to April 2003, covering conduct by former employees of Polar LLC. William J. Flynn, President and Chief Executive Officer of AAWW, commented: "We are glad to put this matter behind us. It is important to note that it involves conduct that began in 2000, almost two years before Polar LLC was acquired by AAWW -- with final DOT approval of such Polar LLC acquisition not being granted until late May 2002. The matter occurred before Polar LLC’s emergence from bankruptcy in July 2004 and relates to a period more than seven years ago. It is also important to note that none of Atlas Air, Inc., Polar Air Cargo Worldwide, or any of AAWW's current board or senior management were involved in or are implicated in this investigation." The plea agreement executed by Polar LLC is not expected to adversely impact any of AAWW’s other operations, which are conducted principally by two operating subsidiaries, Atlas Air, Inc. and Polar Air Cargo Worldwide, Inc., or other related investigations or litigation. In the second quarter of 2010, AAWW recorded an expense for the full amount of the fine in anticipation of Polar LLC’s reaching an agreement with the DOJ and court approval. The agreement is subject to approval and acceptance by the United States District Court for the District of Columbia. 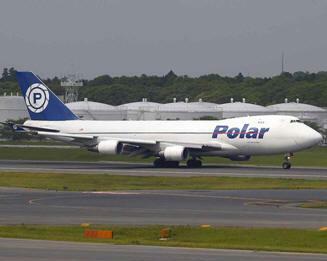 Polar Air Cargo is an American cargo airline based in Purchase, New York. It operates scheduled all-cargo services to North America, Asia, Europe, and the Middle East. Its main base is Anchorage International Airport, Alaska, with hubs at Los Angeles International Airport, Cincinnati/Northern Kentucky International Airport, and Incheon International Airport near Seoul, South Korea.